Dhrupad pandit performs pooja. Gopadevi/Krishna signals Vyomesh to just nod head when she speaks. Baldevi/Balram walks to her and fumes that he did not have so much food in his life that he is preparing in a day today. Gopadevi/Krishna says she knows Baldevi will manage. Baldevi gets more angry and says that is why raas/dance is not happening in Barsana. Gopadevi/Krishna says raas will happen, calls Dhama and says Baldevi is talking about him. Dhama gets excited. Baldevi says she was telling how helpful he was. He says it was his duty. 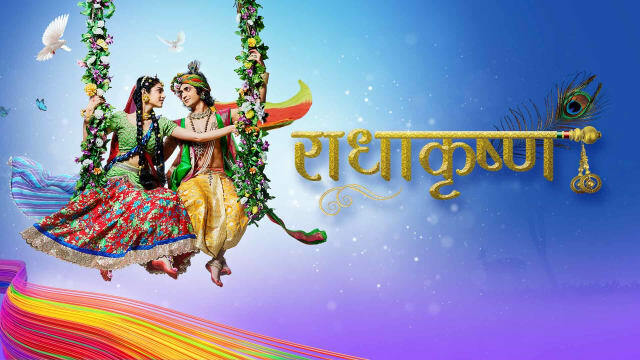 Radha reminisces incident with Krishna and thinks why she is remembering him. Vrishbhan says let us start tilak ceremony and asks Radha to come forward. Gopadevi/Krishna says how can tilak happen when Narayan is not happy yet. Vrishbhan asks what does she mean. Gopadevi/Krishna says bride has to dance to make Narayan happy. Vyomesh says even he heard same. Vrishbhan says Radha is an amazing dancer and asks Radha to dance. Radha walks limping and says she stepped on some sharp object while coming from her room. Vrishbhan apologizes Vyomesh parents that Radha cannot dance. Baldevi says if not Radha someone else will dance and make Narayan happy. Vrishbhan asks who is she. Baldevi says Gopadevi. Gopadevi/Krishna via telephathy says via dance, he will make Radha forget her pain. Gopadevi/Krishna starts dancing with Goopis. Radha gets excited and joins her. Ayan reminisces Kans’ aide informing that his dacoits will enter and kidnap Radha, Ayan has to make way for them. He walks away silently and killing guards lets dacoits in. Radha continues dancing with Gopadevi. Mahadev watches and thinks Gopadevi and Radha’s dance is better than Radha and Krishna’s dance. Radha imagines Krishna in Gopadevi. Once dances fishes, Radha slips and Gopadevi holds her. Radha looks into Gopadevi/Krishna’s eyes and thinks who is she. Gopadevi/Krishna walks aside nervously. Balram via telepathy asks if Radha is doubting him. Gopadevi/Krishna asks to speak good at least and tries to leave silently. Radha stops her. People shout that dacoits have attacked them. Baldevi acts as panicking. Dacoits order that men and women should stand in a separate line. Baldevi gets angry and asks Gopadevi to let him handle dacoits. Gopadevi stops her and says it is not time yet. Dacoits order to kidnap Radha and her friends and take them away. Baldevi tells Gopadevi/Krishna that she cannot stop now. Gopadevi/Krishna says it is time for Narayan and Seshnag to enter and save dharma. Krishna gives moral gyaan that in this world what is biggest sin, some say it is lie, some say fraud, etc., betraying woman is the biggest sin; how will they punish the culprit; to escape from losing dignity, one has to not cross the line; they have to stop the culprit right away, then no one can harm their dignity. Precap: Gopadevi saves Radha from dacoits. Thorn pricks Radha’s foot, and Gopadevi removes it. Radha looks at Gopadevi’s eyes again.